One of our new superior apartments, Barcelona Balconies 1, is the featured apartment of October! 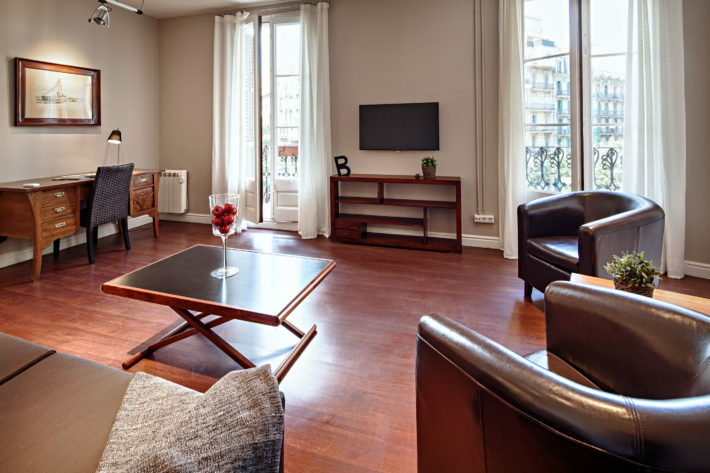 The lovely and bright apartment of 90 m² offers a quality stay in the heart of the city for up to 6 people. Barcelona Balconies 1 is located in the street Enric Granados, which is home for many high-class restaurants, shops, and galleries. The street, named after a famous Catalonian pianist and composer, is a semi-pedestrian one. It’s boulevard-like with palm trees and wide pedestrian sides. Take North and you will reach the Diagonal Avenue, go South and you’ll bump into the University of Barcelona. The street can be found in the neighborhood of Eixample, just on the border of the right and the left Eixamples. Full of lively bars, diverse dining options, various stores and architectural objects, this district is a true highlight of Barcelona. Nicknames “Gaixample” and “Beerxample” only go to show the diversity of the neighborhood! Metro lines L3 and L5 pass through two metro stops nearby, so you can easily reach all of the sights not only on foot but also with public transport. La Pedrera – 0.66 km. La Pedrera, which is also known as Casa Milà, became a World Heritage site by the UNESCO in 1984. This is the building Antoni Gaudi worked on before he completely dedicated himself to the Sagrada Familia. Casa Batlló – 0.91 km. Casa Batlló, which is now owned by the Bernat family, the former owners of the Chupa Chups company, was built in 1877 and in the years from 1904 to 1906 restored and remodeled by Antoni Gaudí and Josep Maria Jujol. Paseo de Gracia – 0.96 km. 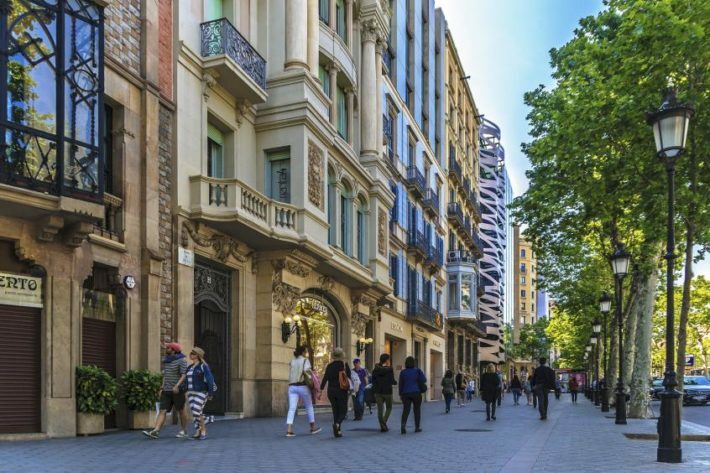 The Paseo de Gracia is arguably the most famous street in Barcelona and is great for tourists as it contains everything you could possibly desire from architecture to clothes stores. Barcelona Balconies 1 features two bedrooms which, along with the sofa in the living room, can accommodate up to six people. There is a fully equipped kitchen, a dining room area, a bathroom with a shower and a very spacious living room. As the name suggests, the apartment has balconies in both of the bedrooms as well as in the living room, which fill the area with a lot of natural light. Looking for accommodation for that Barcelona getaway with your family or a group of friends? 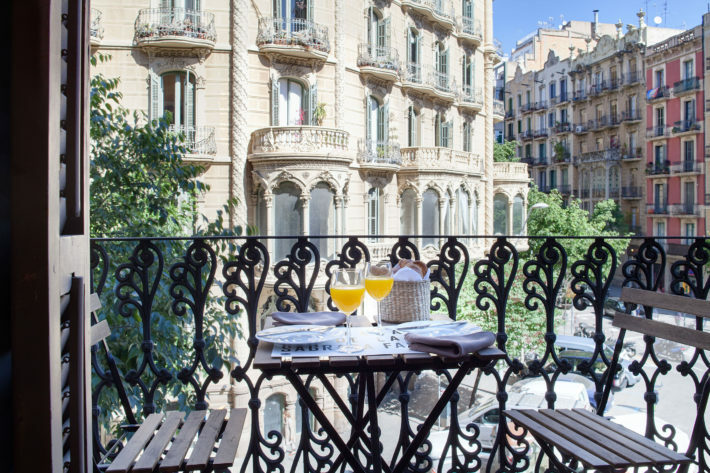 Book the Barcelona Balconies 1 or check out other amazing apartments we offer!